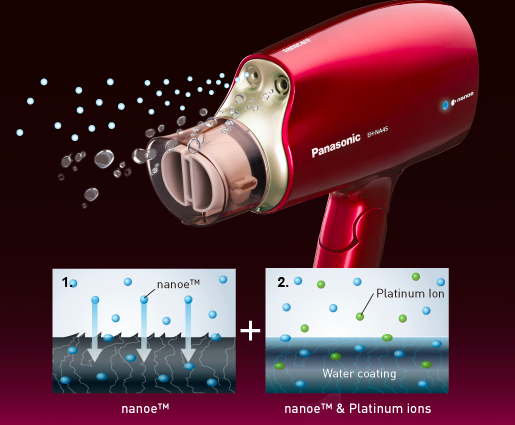 Enjoy nourished, radiant and healthier hair with the Panasonic Nanocare Hair Dryer. Delivering Nanoe penetrating technology and Platinum Ions, this stylish pink dryer makes your hair look great, but feel even better. Say goodbye to frizzy, damaged hair! With Nanoe penetrating your hair cuticles to restore moisture balance and Platinum Ions coating the hair surface to tighten the cuticle, you can be sure that your hair and scalp is getting the salon quality treatment it deserves. Strong UV (ultraviolet) rays can help to strip away hair cuticles and cause hair damage. Platinum ions penetrate to hair tips, preventing damage from UV rays. Is drying taking you too long? The quick dry nozzle on the EH-NA45 not only means less time under the heat, but a healthier drying experience from root to tip. With 6 blow volume and temperature variations, the Panasonic Nanocare Hair Dryer helps you to find the ideal mode to meet your styling needs. Nourish your hair whilst creating your perfect look. The 50 degree drying temperature on this Panasonic dryer prevents unnecessary damage from excessive heat, leaving you with healthy, show-stopping hair, every day.